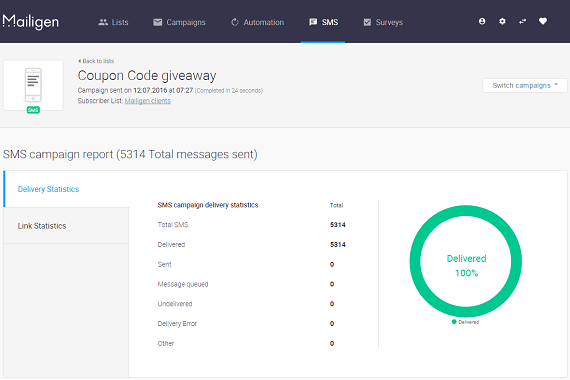 Our platform includes detailed reports for completed SMS Campaigns. Select the Reports option from the SMS Menu. This will open the SMS Window. Contact List—the contact list that was used in the campaign. You can click the list to view the subscribers. Delivered—the total number of SMS messages delivered. Sent—These represents the phone numbers from which we receive a responding “OK” message when the SMS is received. Unfortunately, depending upon the subscriber's carrier, we may not always receive this confirmation message. Message queued—These are messages waiting to be sent. Undelivered—the number of messages that are still undelivered in the event that the campaign is still on-going. Individual links that have been clicked—These represent the number of individual links clicked by subscribers. For example, if there are three links in your SMS message and a user clicks on one of them, this number will be 1. If another user clicks on the same link, it won't be counted in this number. Total unique clicks—These represent the first click, from each person, on a link. 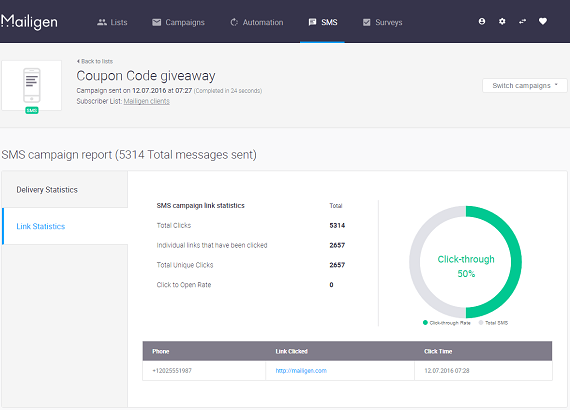 For example, if there are three links in a SMS message and a subscriber clicks on one of the links 1 time, that click will be represented in this count. But if the same subscriber clicks on the same link again, it will only be counted in the total number of clicks. Click to open rate—the total number of clicks divided by the number of deliveries. The graph on the right displays click statistics (number of clicks over time) by month for the SMS campaign.